This recently completed waterfront project in Sydney's Inner West, illustrates the creative new Axolotl coating techniques that make a statement of any entrance. The client worked directly with our in-house design team, to select finishes and designs that complemented the natural stone and bronze elements already selected for the home. The door and side panel were finished with a contemporary lineal pattern and then coated with Treasury Bronze Pearl with a Lunar texture. Axolotl LINK glass, with a Seaweed pattern in Brown Rust, was chosen for the divider wall on the top level. It brings a soft diffused view from the lounge and a stunning feature for guests arriving from the lift. The results beautifully reflect the meticulous material selection and perfectly executed workmanship. 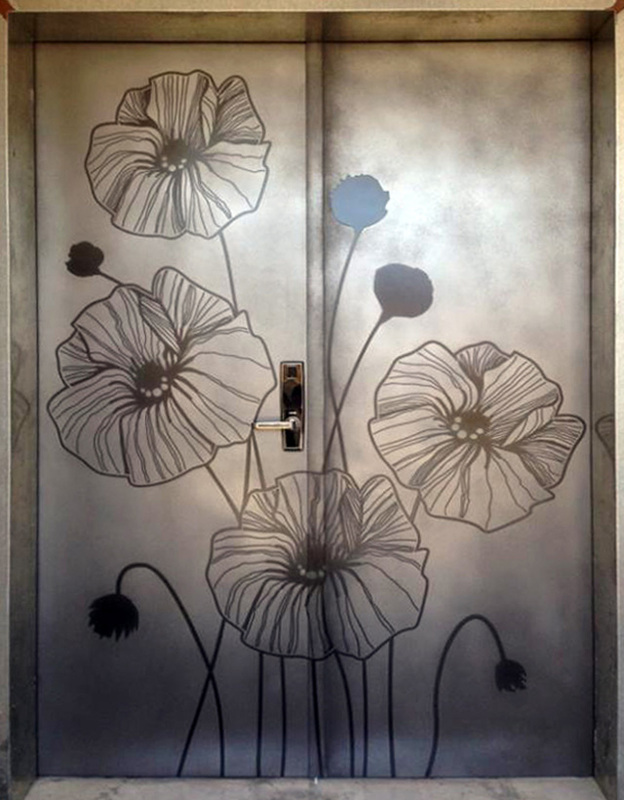 The two entry doors displayed below, illustrate the combination of subtle or bold texture with Axolotl metals. The 3D pattern is finished in Treasury Bronze smooth pearl, the other in Black Graphite Viper. Published on March 03, 2014 by axolotlblog.